Knitting at the Movies: The Debt | Knit Like You Mean It. Ball of Shelter Yarn in AMC Hoffman Drink Holder: Fits Perfectly! Mr. Trask was unwilling to take a photo of me knitting in the theater (sigh). Last night, Mr. Trask and I went to the movies with Jeff of GGSG. Inspired by Helen Mirren’s glorious career (as well as an NPR story suggesting male movie roles for Mirren AND our silly Twitter conversation on other roles), we went to see Mirren’s latest, The Debt. It was a real thriller – tense, tight, well-written and -acted. 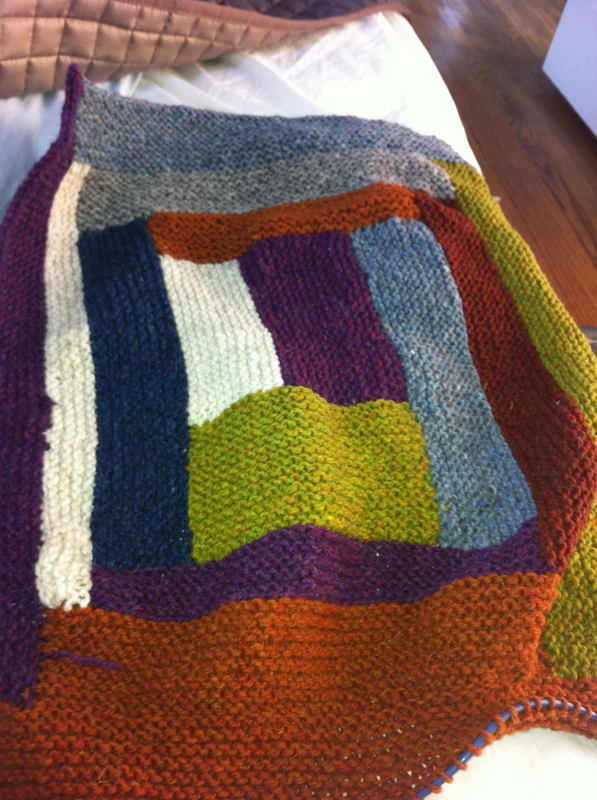 I knit all the way through, not because I was bored, but because I was intensely anxious – but, you know, in a good way. Shelter Blanket after the film: only one weird color choice, the orange. Victory! The film included a knitting moment, but not my favorite. One scene takes place in a Ukranian mental institution, a grim place indeed, and the camera pans past a nurse teaching a patient to knit. He’s holding enormous needles and struggling to complete the stitch, and she’s leaning awkwardly over the arm of a couch to help him. Neither looks particularly happy, and both Jeff and Mr. Trask looked over at me after the shot, as much as to say, “You belong in an asylum.” However, let me point out that the man in the institution did NOT know how to knit when he entered the ward (otherwise, she wouldn’t be teaching him), and clearly he is being taught in order to help restore him to health. Knitters are sane: QED. 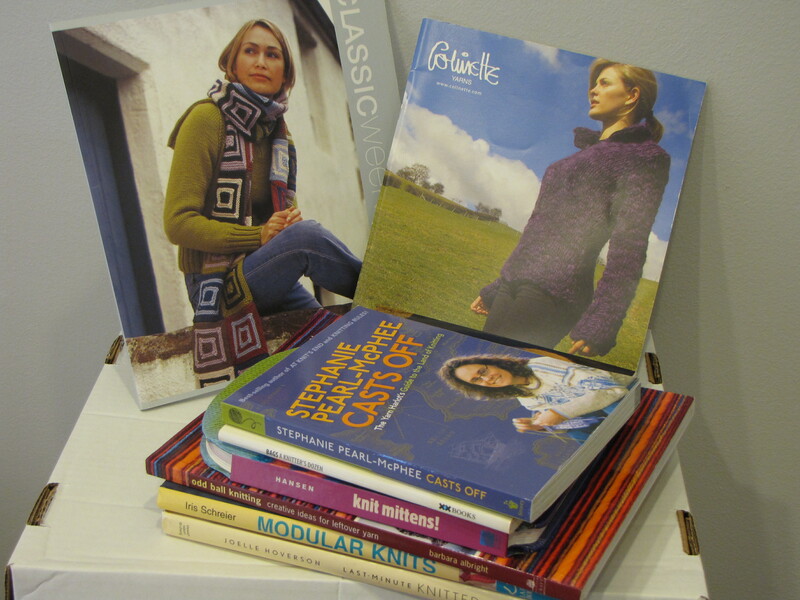 The Second Exciting Book Giveaway: includes Stephanie Pearl McPhee and some nice pattern books. Stephanie Pearl-McPhee Casts Off, by Stephanie Pearl McPhee. Knit Mittens!, by Robin Hansen – one of my favorite mitten designers, an expert in traditional colorwork. 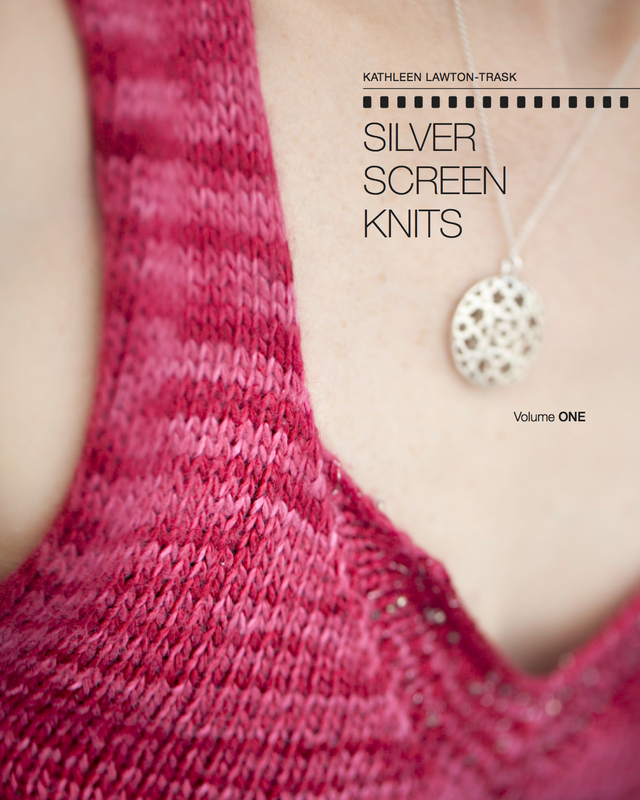 Modular Knits, by Iris Schreier – the owner of Artyarns! Last-Minute Knitted Gifts, by Joelle Hoverson of Purl Soho. An amazing book. Comment on this post by noon EDT on Thursday, 8 Sept. 2011 for a chance to win. Please remember that, if you comment here to enter the giveaway, you are committing to pay for postage. The easiest way to pay for postage is to wait until the package arrives, read how much postage is on the package, and add a dollar or two to cover the mailer itself. Then use the Paypal button in the right-hand column of the blog to donate that amount. Again, thank you to all of you who are willing to pay for postage. Congratulations to all who won! Check your e-mail, send me your address, prepare for knitting book nirvana, etc. Not sure what to say in your comment? Tell me your favorite knitting book or author (mine is Elizabeth Zimmermann); tell me if you knit at the movies; tell me how you feel about Helen Mirren; tell me which male movie role you think she’d excel at. Heck, tell me how your weekend has been! As The Master might say, Anything Goes. How exciting, a knitting book giveaway! I’ve never knit at the movies, mostly because I don’t go that often, and I am a newbie knitter. I also require quite a setup for knitting, and don’t think I could manage it all at the movies! My knitting, my pattern, a cold drink, a snack, and my comfy chair. 🙂 Thanks for a great contest! If I win, I’d be happy to have any of these books, no preference here. wowie-zowie, kathleen!! thank you!! i am so impressed that you continue to blog as frequently as you do with all that is going on in your life – when exactly do you & mr. trask leave on your grand adventure? my favorite knitting author is EZ – i get a kick out of her & totally appreciate the creativity & wit. there are others tho’ including the yarlot, mags kandis, & ann budd – i’m probably forgetting many many more, but if i want to just read a knitting book it’s EZ all the way. I am – right now – interrupting finishing my first pair of adult socks to comment. Would love the last minute gifts book. Wow! I’m a newlywed and my kids and I have been spending the weekend with my new husband. Such a treat. I read to him your comments about impressing him with the Criterion “Brazil” — that REALLY resonated with us. I’d love the Rowan book – a Martin Storey sweater is on my knitting bucket list. You’re making the log cabin blanket! I keep saying I’m going to do that one of these days. Maybe I need to purchase gorgeous yarn and get inspired. My weekend was lazy and interesting, for me. Saturday we accomplished nothing, but grilling dinner. I mean breakfast was even donuts(sp?). Sunday morning I finished another kitchen towel. Then we went to the zoo only to leave and find a dead battery in the car. I am still baffled how that happened. Everything was off, the car alarm wasn’t even set! Luckily the guy who wanted our parking space had jumper cables. Then the afternoon getting a pedicure and visiting the pool. I would prefer (if a winner) Last-Minute knitted gifts …… I’m pretty sure I will be able to put it to good use. This is so weird, we were at the 2:05 showing of the same film. My first commnent upon sitting down was it was too dark to knit in there but that was because I’m making a complicated castle design blanket and I really have to keep track of the chart. I will have to try the cup holder idea. If I were to win, thereby assisting you directly in your move which is only right and pretty noble of me, I would be interested in the Oddball Knitting or Last Minute Gifts books. Who am I resist a book with the word “oddball” in the title or a book that promises to aid me is doing things at the last minute? I have never knit at the movies even though, like you, I find knitting helps my brain keep going. When I was a little girl at boarding school I would knit in the dark once the lights had gone out for the night. As I recall it was usually a mess in the morning. I have threatened several times to take my knitting to church as think how much knitting I could get in during the sermon time and I really would be listening! So far I have chickened out but maybe if I sit at the back . . . 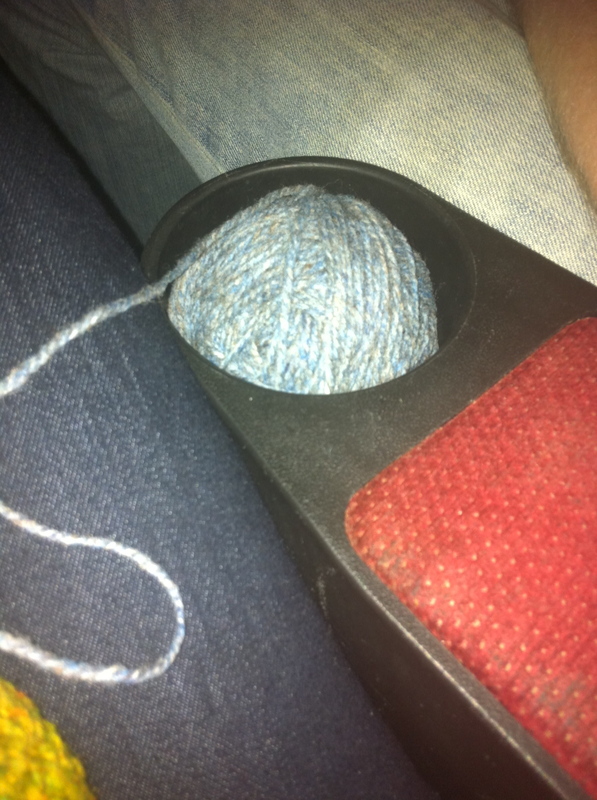 I knit mostly in my car and at the beach (it’s very close by…) but I couldn’t at the movies. I’m not fast and I need to see what I’m doing so I envy you a lot. Thank you for this giveaway, it’s really difficult to chose but I would love to win Last minute gift. It is so inspiring. Gee, I can hardly wait to see how hubby reacts when I take over his drink holder with yarn. Glad to hear the Helen Mirren movie is good – I have a bit of a girl crush on her, and have been thinking of inviting my husband on a movie date soon (we go about once a year). I knit when watching movies at home, but have never done it in the theatre yet – mostly because I go so infrequently! The Helen Mirren movie is soooo good. Not what I was expecting – but so much better than what I was expecting. Drag that husband out on the movie date; Mr. Trask really liked this one. Good to hear – hopefully I’ll make it happen this weekend! I loved the handknit sweaters that the Sam Worthington and Marton Csockas wore in “The Debt”. Did you notice them? My wife has offered to knit a sweater for me and I’ve found that the best looking men’s hand knit sweaters seem to show up in films and I’m hoping to track down similar patterns. Last year’s, “Never Let Me Go” also had great hand knit sweaters. I’m assuming the costume designers commission expert knitters to create the sweaters? Ooh! I eyed those sweaters, too. I haven’t seen “Never Let Me Go,” but it is on my list – and just moved up by virtue of your hand-knit-sweater recommendation. I admire my wife’s knitting talent and I’m impressed how nice knitters all seem to be! I promise I will try to learn. Reading the responses to your question about knitting for husbands, I think the time is ripe for someone to solve the “sweaters-for-husbands-are-always-unsuccessful” problem. When I asked my wife to knit me a sweater, she reminded me about the sweater she knit for me in 1985 that I never wore. I promised to be more involved this time in choosing the pattern. Looking through the catalogues, the only patterns that seemed nice were for very heavy fisherman-style sweaters. We live in California and it’s just too warm for that kind of sweater. I’ve found a few promising men’s sweater patterns, but 90% of the designs are hilariously strange – like they just gave up. So now I’ve been noticing the beautiful hand-knit men’s sweaters that are appearing in recent films – I want that!